We are excited that you are taking the next step toward your future. Our admission process is designed around you and your experience. Our goal is to ensure that we get to know you and for you to get to know Wayland through a smooth and simple process. 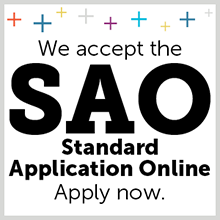 To begin your application, use the SAO (Standard Application Online). Once signed in, you may also review your progress. For assistance call us at 920 356-2120 or email us at admisson@wayland.org. We would love to introduce you to everything Wayland Academy has to offer. Learn more about the academics, activities, and advantages of attending Wayland Academy by requesting additional information. Once this form has been submitted, you will receive a personal admission packet in the mail and your admission counselor will call you to discuss your next steps. To be considered for our priority application deadline, please complete the Standard Application Online (SAO) by February 1st. If submitted after this date, your application will be considered on a rolling basis if space is available. Please contact the admission office at admission@wayland.org after February 1st to confirm if space is available. Decisions will be made two weeks after February 1st. Please provide transcripts for your past two consecutive years of schooling. These may be submitted through the SAO or by emailing them to admission@wayland.org. Recommendation forms from at least two current academic teachers must be submitted along with your application. These forms are available through the Standard Application Online (SAO) and are submitted via the site as well. Applicants should submit the results of standardized testing such as the SAT, ACT, PLAN, PSAT, SSAT, Terra Nova, Explore, ACT Aspire or Iowa tests. Results must include national percentile scores for the student. This information is sometimes included on your transcript, so check with your school before requesting additional copies. Learn more about SSAT testing. Wayland’s SSAT code is 8056.
International applicants must have a statement of financial support and a copy of a passport photo page. If a student has not been in an English curriculum for at least four years, please provide English Proficiency test scores (Duolingo English Test, TOEFL, IELTS, or TOEFL Jr.). We hope that you will visit Wayland for an interview and tour. Please complete an online request form. Interviews are available Monday through Friday and on weekends by appointment. A campus visit requires approximately two hours and a shadow day typically will last from 8:00 a.m. until 3:30 p.m.
Wayland offers need-based financial aid. If you are interested in applying for financial aid, please notify your Wayland admission counselor. You should apply for aid as early in the admission process as possible. Find the financial aid application online. Wayland also requires a copy of your most recent Federal 1040 tax returns and W-2’s. International applicants should provide three months of bank statements and proof of income. Thes documents must be translate into English and the currency converted to USD. Wayland Academy does not discriminate in its educational programs, and admission is open to students of any race, gender, color, national or ethnic origin, religion, sexual identity, or sexual orientation.